Not every consumer responds favorably to the same marketing approach. Just as comedians can be dry or slap-stick, wine can be sweet or oaky, and paintings can be real or abstract, direct mail marketing can be official or promotional. Official mail pieces enter the mailbox disguised in an outer envelope that looks as though it could be coming from a governmental office, a legal entity, or with an implication that a previous relationship exists with the consumer. The recipient doesn’t need to understand the proposition immediately. Promotional mailers, on the other hand, employ art and images liberally. They clearly communicate the offer early on, often taking a friendlier approach. In spite of its lack of color, official mail can still be more expensive than promotional mail, because it involves more components, such as envelopes, glassine windows, affixed cards and various inserts. Official mail tends to work best in the insurance, credit card, and mortgage and loan categories. Letter and envelope packages – which are often official in nature – accounted for more than 80 percent of mail volume in all three industries in December 2014, according to marketing research firm Mintel Comperemedia. 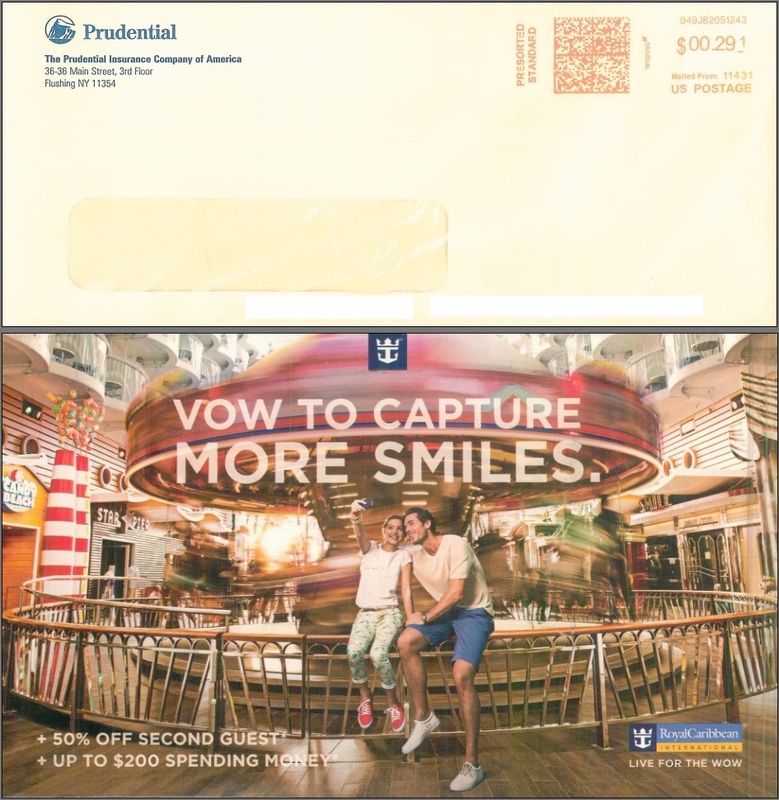 Prudential relies on an official-looking envelope (top), while Royal Caribbean takes a more promotional approach (bottom). Photo courtesy Mintel Comperemedia. “If we have an insurance concept with heavy imagery, many consumers dismiss it right away, because they see it as an offer for something they don’t want,” said SeQuel’s Co-Founder & Chief Operating Officer, Jay Carroll. The key is trying to tap into the emotion of fear by stressing the consequences of not opening the envelope, without relying on art to catch a consumer’s attention. Due to regulations, insurance marketers cannot incentivize the sale with an offer, thereby leaving that marketing angle off the table. For promotional mailers, consumers usually have an emotional affinity with the product. For example, nonprofit packages sometimes show a starving child or an unclaimed animal on the outer portion of the piece. According to Mintel Comperemedia, nearly 60 percent of the tobacco sector’s December 2014 volume was self-mailers, which usually lean promotional. Self-mailers also accounted for more than half of banking volume. SeQuel has seen these principles play out in its testing efforts with a prominent identity theft protection service. The product doesn’t carry an imagery connection that resonates with consumers, so SeQuel invests more in concepts that rely on facts, education and statistics. Nobody likes to think about life insurance, final expense insurance or health insurance – so one would expect official mail to work best in all cases. Travel insurance, however, seems to benefit more from a promotional approach. Even though travel insurance is an exception to most insurance-mailing rules, it’s still important to play on fear – but using art to tell the story. In new client campaigns, SeQuel generally structures its hybrid multivariate test matrices with a reasonable split of official and promotional mail – largely based on industry and past testing experiences. Ideally one style will trump the other, and then all testing can be either official or promotional – or a hybrid of the two.